Jamaica, that incredibly beautiful island with its picturesque beaches, stunning waterfalls and lush green vegetation has so much more to offer visitors than merely spending days by the pool. Luckily, planning your own perfect holiday in Jamaica is not only easy, it’s also the best way to truly experience life on this tropical gem. Your holiday will most likely start in either Kingston, the island’s capital, or Montego Bay, as this is where most international flights arrive. Once you’ve sorted your Jamaica tourist tax, a landing and departure tax for all visitors to Jamaica, either of these two locations are ideal for kicking off your holiday and exploring the island. There are many options for accommodation: major cities along the coastline have standard hotels in all price ranges from Airbnb sites and budget hostels to more luxury and boutique hotels. And guesthouses can be found in almost every town, even in the most remote parts of the coast. The world-renowned picturesque white-sand beaches along the coast of this entire island will take your breath away. Plan to visit the famous Seven Mile Beach in Negril, where this natural oasis with its aquamarine waters and soft sand is ideal for water sports such as snorkelling or parasailing. It’s also close to Montego Bay, Ocho Rios and other popular Jamaican destinations, so you’ll have the opportunity to visit many more beaches such as Doctor’s Cave with its therapeutic waters and relaxing atmosphere. For a more peaceful retreat bathing amid iconic scenery, try the deserted Treasure Beach on the south coast. ATMs are found throughout the island if you need any extra cash, and US dollars are accepted nearly everywhere. No holiday to Jamaica would be complete without taking part in some of the exciting activities on offer. Watch the sun set on top of the island’s tallest peak, the Blue Mountain, or take a high-adrenaline mountain-bike trip through the coffee plantations of St Andrew. And many of Jamaica’s numerous waterfalls are not only beautiful but also offer zip lining, cliff jumping and swimming. Popular choices are swinging from a rope into the pool below YS Falls in St Elizabeth or Dunn’s River Falls in Montego Bay where you can climb the cascade on your own and take stunning nature shots. You can always slow down the pace by drifting up the Martha Brae or Rio Grande rivers in a bamboo raft, taking in the Jamaican jungle. 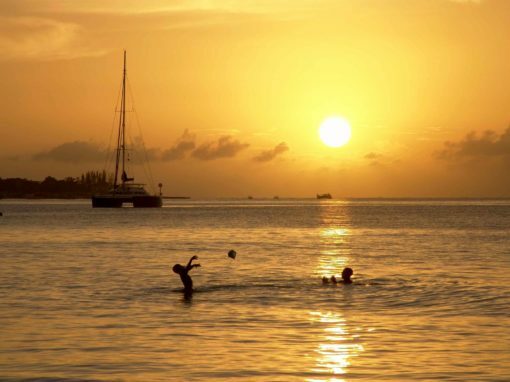 It’s always good to plan some downtime, and Jamaica’s rich and vibrant culture makes it easy to do that. Reggae music is deeply connected with the Jamaican identity and there are plenty of shows that pay homage to the nation’s musical culture such as Reggae Xplosion in Ocho Rios, The Jungle in Negril or even better, its annual festival: Sumfest. Eating out in Jamaica is also easy. You’ll find mouthwatering jerk chicken and pork cooked and sold in shacks on the side of the road, with some of the best found in Portland, celebrated every July at the Portland Jerk Festival – there’s even a Jamaica Jerk Trail for food lovers. There are plenty of places to eat across the island, too, from dining on the beach to eating on hillsides overlooking a stunning sunset. On practically every corner there’s some form of transport ready to take you almost anywhere on the island, so getting around Jamaica is fairly easy. The Knutsford Express is a good-value option. The country’s major bus company runs between all the major hubs and tourist hotspots. You can also choose to travel by taxi or minibuses, plus air-conditioned coaches and coaster buses can be booked for day trips – always look out for their red numberplates. Shake off the winter blues and plan your perfect getaway to Jamaica now – it’s easier than you think. And doing it yourself lets you experience Jamaica in a way day trips and excursions just don’t allow. Next readingIs Your Family Ready for a Vacation?